If you’re not up for the strenuous hike to Machu Picchu on the Inca Trail, you’ll likely end up taking one of the trains along the Urubamba River to the town of Aguas Calientes, where you can catch a bus up to the top of the mountain to see one of the world’s most famous ancient citadels. If you do it as a day trip, you’ll arrive at Machu Picchu amidst hordes of other tourists, spend a few hours at the citadel in the peak of the midday heat, and zip back to Cusco on the train without having had a chance to absorb the cloud forest in which Machu Picchu is set. There’s a better way. There are a variety of hotels in and around Aguas Calientes where you can spend a couple of days enjoying the ambience and exploring not only Machu Picchu itself, but also the cloud forest that cloaks the mountains in which this amazing ancient wonder is located — the same cloud forest through which Hiram Bingham and his guide hacked their way in 1911 to find what has become the most famous ancient ruin in South America. Peru is a patchwork of widely differing habitats: vast stretches of desert along the coast, the craggy Andes mountains down the spine, the cold and desolate Altiplano high up in the Andes, the lush rainforests of the Amazon basin on the eastern side of the Andes, and the marvelous cloud forest surrounding Machu Picchu, which many people don’t take the trouble to visit. The hotel we stayed at, the Inkaterra Machu Picchu Pueblo Hotel, just across a short bridge from the main part of Aguas Calientes, has won numerous awards and this year was named one of the top 5 resorts and lodges in Central and South America by Travel & Leisure magazine. It’s more affordable than you might think, though, and makes a wonderful base for a few nights. You’ll stay in your own bungalow set amid the gardens, where thick woolen blankets ward off the night-time chill, toiletries are made from botanicals right on the property, and you’ll eat some of the finest food in Peru. The ambience is very relaxing, so you can choose to just chill out a bit after the challenges of the altitude in Cuzco (about 4,300′ higher than Aguas Calientes), although you’ll still get a bit breathless walking up and down the stone paths at the hotel, but there’s plenty to do if you feel like exploring. The first thing you’ll probably want to do is visit Machu Picchu, which you can arrange through the hotel, who’ll provide a private guide and the entry passes – the site is now restricted to only 500 people a day. You’ll get up for an early breakfast and take the bus up the mountain (a hair-raising ride in itself) at dawn to be among the earliest to arrive, and you’ll spend several hours exploring the massive site, stopping to rest for a light snack as well. Some things to know beforehand: the morning air heats up very quickly to an intense blaze, so wear a good sunblock, a wide-brimmed hat and an overshirt with sleeves that you can roll down when you start to broil. There are no washrooms inside the citadel, so make sure you visit the ones outside the entrance gate. The site is very steep, and the ancient staircases are worn and slippery, with little in the way of handholds or barriers, so be very careful and take walking poles if you’re not steady on your feet. On the way out, don’t forget to have your passport stamped — Machu Picchu has its own stamp that you can add to your collection. After your visit to Machu Picchu, you can have lunch in the charming and picturesque town of Aguas Calientes, which has plenty of decent restaurants to try authentic Andean food and a thriving craft market, or you can return to the hotel. Make sure you try the passion fruit cheesecake at least once either in town or at the hotel. The hotel is set in its own private 12 acres of cloud forest, so if you feel like exploring after lunch, you can do so on your own or in the company of a naturalist, just viewing the forest ecosystem or doing some bird-watching. The cloud forest is also home to over 300 species of wild orchids, and if you visit in the November orchid season as we did, you’ll be treated to an amazing variety of the flowers in all shapes and sizes. I’d recommend booking the orchid tour with one of the naturalists, though — many of the plants are quite tough to spot without an expert eye. The Inkaterra has also partnered with the Peruvian government to rescue and rehabilitate the native Spectacled Bear, the only bear in South America. The bears are gentle arboreal creatures who are often captured illegally to either sold as pets or killed for their body parts, for which there is an appalling trade in Asia. There were 3 bears on hand when we visited, and they were delightful to watch. The Inkaterra also grows its own herbs for the kitchen, and has its own small tea plantation, where you can learn all about tea production and make your own bag of tea to try out. Most of these activities are included at no extra cost in your stay at the Inkaterra, but if you like there are a nice selection of activities with a range of prices as well: you can book a spa treatment — I had a fantastic massage with fragrant botanical oils — or have a native Andean purification ceremony, see a musical performance, etc. Breakfasts and dinners are included, and the food is terrific. The breakfast buffet alone is worth getting up early for! At the end of the day, you can snuggle up in your comfortable bungalow and listen to some of the night sounds of the forest all around you. It’s a great way to see a bit more of Machu Picchu than most people bother to experience. 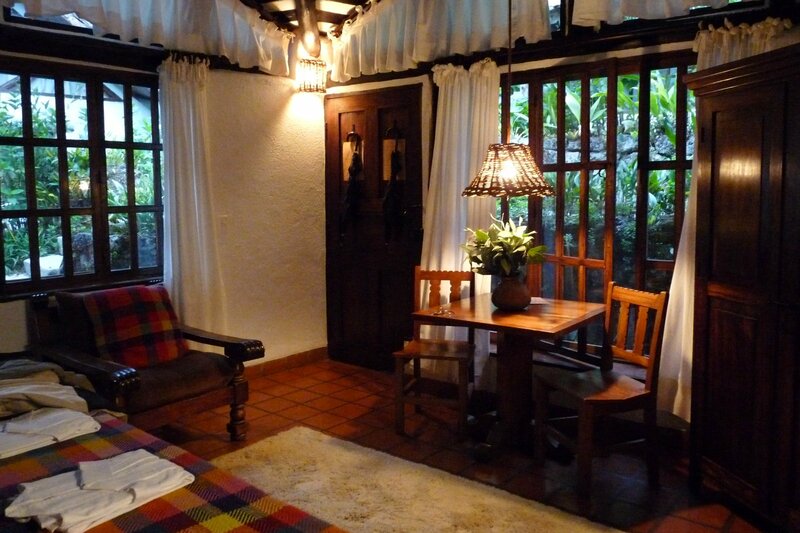 The people at the Inkaterra were great to deal with, and very enthusiastic about their hotel and Machu Picchu. If you’d like to do Machu Picchu a little off the beaten path, you can’t go wrong with this choice!